LISTEN UP! THE BEST ART & PHILOSOPHY IS ON YOUTUBE 4SHURE! Gillian Wylde will present a live performance of fragments, texts, images and ideas trending in some of her recent work. Wylde’s work stages a critical engagement with high/low theory, shadow feminisms, happy nihilisms and the mediated. Overlaps make time for nice collisions, rude electricity and instances of ‘traumedy’. 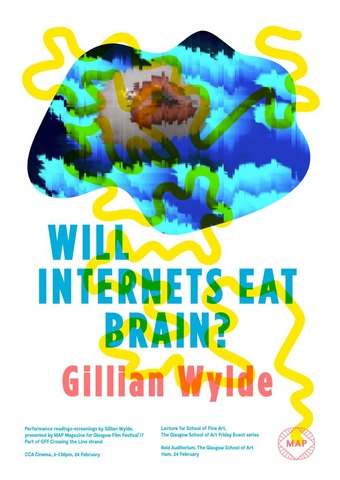 Processes of excessive or un-necessary post-production present a savage smell or hairy logic, 'Will Internets Eat Brain?’ is an exclusive insight to Wylde’s world. In advance of her performance for the festival, Gillian Wylde will deliver a lecture for The Glasgow School of Art 'Friday Event' series at 11am, 24 February, at Glasgow Film Theatre.